I have mentioned before that one of my colleagues, Christopher, is very into coffee. He is also very into beer. When given the chance to combine the two, well, it can be inferred that he will be a very happy person. Upon a recent trip to Southern Oregon, as Josh wrote about a while ago, one of the things Erik, Josh, and I did was to stop by Harry & David's: Country Village. While there I picked up a couple of bottles of various local, Northwest beers that I thought Chris would enjoy. A couple of the bottles I picked up were of various combinations of beer and coffee. I was incredibly intrigued by the possibility of how these would come out, and I was hoping that my colleague would be as well. 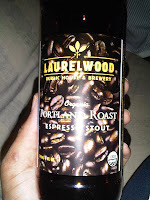 we decided on the Laurelwood Organic Roast Espresso Stout. While I did not take any pictures of this beer, both Chris and I were struck by the very deep dark colour of this beer. It poured like all of the properties of a stout - dark and rich, with one minor exception. While pouring the glasses, the aroma of coffee and espresso were quite obvious, but not in an overbearing way. When I bought my pint to my mouth to drink, I almost thought that I should blow on it to cool it off a bit, but then I realized how silly that would be. Upon drinking this Espresso Stout, I definitely could taste the coffee with the combination of the beer. It was actually kind of cool. I liked it a bit, and it appeared to meet Chris's seal of approval as well. We will have to see where Adventures in Beerland take us next. Glad you enjoyed it and I'm looking forward to reading more of your beer adventures!